Friends. Have you heard of Chairish? It's an amazing vintage goods shopping site that's making huge headway amongst the marketplace...and they've definitely caught my eye. So much of what I do revolves around shopping, and seeking out one-of-a-kind (often vintage/antique) finds that lend my clients' spaces an unmatched amount of interest. After all, my design aesthetic is very much 'collected' -- meaning nothing hails from the same vendor, storefront, era, or patina. It's counter-intuitive, but an immense amount of work goes into the 'casually evolved' room, which means I'm incessantly scouring online shopping sites and local antique dives. So...here comes Chairish...and suddenly my hunting days are easier...and yep, my wallet less full. So many of my designs evolve into a relatively neutral palette, so I thought it would be super fun to pull myself out of that realm and into one that's more colorful and playful, yet still uber-refined and chic. Bold...but with an air of classicism. So, thanks to Chairish and their well-stocked inventory, these bright yellow mod beauties served as my jumping off point. And yes...they are crazy. So how do you incorporate such a statement-making find, and keep the space from overwhelming the eye and dating itself too quickly? And that's the key to executing a super-bold piece--it's all about the balancing act, and anchoring the statement with paired down pieces. In order to do just that, I toned down the canary-hued upholstery by incorporating a lavender gray-hued French Provincial sofa that complements that yellow and soothes the eye. And, the sofa's classic, elegant lines offset our statement chairs' modern shape and busy tufting. The next item introduced is an antique Turkish rug--it's gorgeous, classic pattern and neutral colorings anchor the furniture in such a calming manner. And, the charcoal threading allows the sofa's coloring to really 'pop', but also make sense. And from there I simply filled in with more clean-lined and neutral accents and artwork: the brass hardware on the wall sconces mimics a toned-down canary yellow, providing that key element of repetition to the design. Graphic, modern artwork is offset by simple sketches and a classic oil, and I just couldn't resist that emerald-hued Scalamandre throw pillow--the perfect addition to that European sofa. So there you have it! 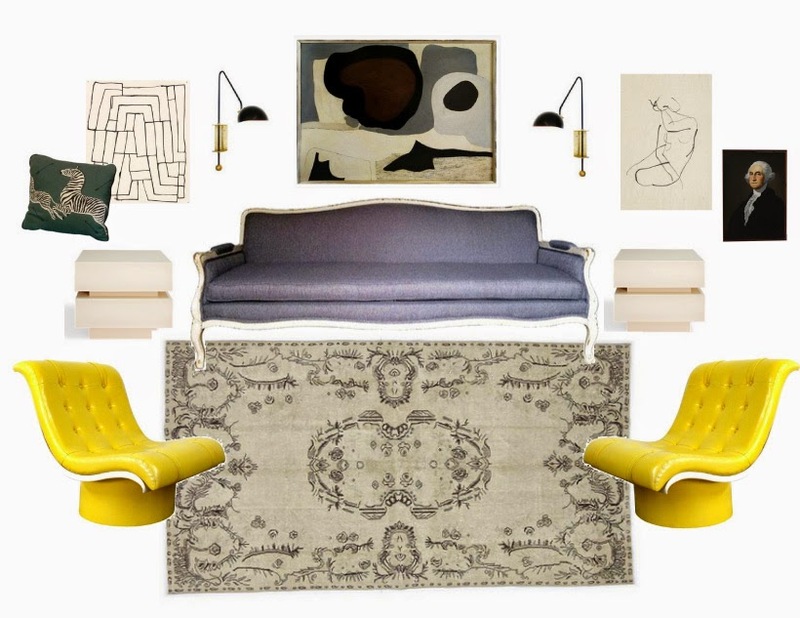 My statement of a design board, thanks to Chairish and their amazing vintage goods, and those fabulous canary yellow accent chairs. Happy shopping! Happy Thursday. Hope you're feeling uber-inspired.